C-Space is delighted to present BEING TIME, the first solo exhibition by Dutch artist Carine Weve in China. On the 20th of August Weve left her drawing table in the Netherlands for a wall in C-Space, which for three weeks will be her worksheet. During that time she will share with visitors the creative process of realizing a large wall drawing “Square Time”. A process characterized by monotonic execution, repetition and concentration. 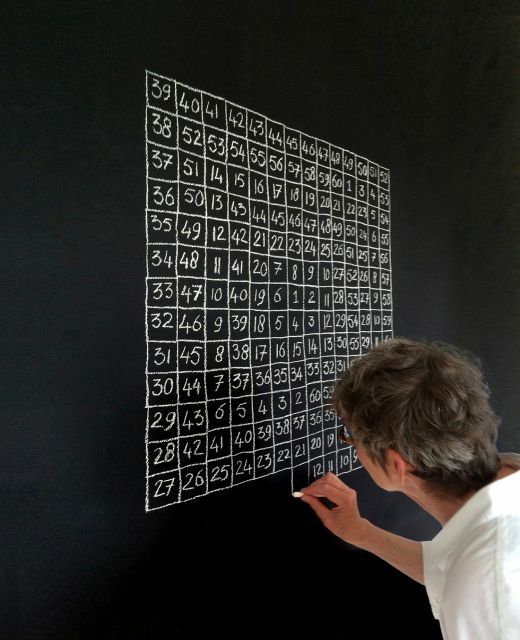 Since 2012 Weve dedicates herself to creating conceptual pencil drawings, submitting them to simple, strict rules that result in strong mathematical images. The feel of handwork and the precision of execution give the drawings a delicate and poetic quality. Characteristic for the working process is the build-up from the centre, circling clockwise so that the image evenly expands starting from the middle. Essentially, every drawing is a possible center of an expanding surface that literally takes on unimaginable dimensions. If Weve were to complete the drawings according to her own set of rules, they would indivertibly grow to immeasurable surfaces. This also applies to the mural “Square Time” in which Weve counts the time in minutes, box to box in units of 60 seconds. Every minute is made unique by systematically changing the sequence of the seconds. Would she elaborate the drawing to all possible variants it would result in a surface defined in terms of square light years! With the realisation of “Square Time” as live performance, Weve plays with the time concepts linear-circular, mocks the notion of ‘dimension’ and flirts with the traditional Chinese landscape painting, where the landscape literally unrolls itself, expanding in time. The performance creation of “Square Time” is the heart of the exhibition BEING TIME. In order to capture the creative process and the result through the eyes of the visitors, the artist kindly requests everyone that visits the exhibition to make one or more photos and send them to info@c-spacebeijing.com or our WeChat address: cspacebeijing. Simultaneously with the performance of “Square Time” the drawing project “1+100” is shown. With this series Weve investigates how a structure can escape from itself. Not despite, but because of itself. The 100 drawings are elaborations of a detail of a master drawing and are submitted to the same implementing rules as the master. But contrary to the master, these drawings have a strong structure that at first sight looks like simple repetition. Nothing is less true. The longer one looks at it, the more the eye looses its grip on the structure. Attempts to focus only lead to discovering creaks and confusion in the structure. BEING TIME is made possible by a grant of the CBK Rotterdam. Carine Weve lives and works in Rotterdam. She studied at the Royal Academy of Art in The Hague, The Netherlands. Since 2006 she has taken part in several solo and group shows worldwide: she exhibited her work in Beijing, New York, several cities in Europe and The Netherlands, resulting in purchases by international art collectors. Whitebox Art Center announces "Wang Jiazeng: The Fold of Objects"